Deco Lighting Debuted its All-New Product Offering of Premier Architectural Luminaires at LIGHTFAIR International 2018. Deco Lighting, a Los Angeles-based manufacturer of high performance LED lighting fixtures, debuted its new line of premier architectural luminaires at the LIGHTFAIR International conference, held May 8-10, 2018 at the McCormick Place in Chicago. After refocusing its position as a specification-grade lighting company in 2016, DECO maintained its vision into 2018 with its debut of cutting-edge technologies. Strengthening this new direction into the architectural lighting space, DECO’s innovative offering delves into bold, modern designs for interior spaces. Showcasing a myriad of smart controls and new innovations—including advanced sensor solutions from Philips, Lutron, Enlighted, nLight, and OSRAM—DECO is focused on bringing the highest possible quality of lighting capabilities to market. “This is our biggest year ever, with us transitioning into our spec-grade line. We’re creating innovative products that are going to change and shape the market, such as our integration with Bluetooth Mesh and utilizing the Internet of Things to keep pushing the envelope in lighting,” says Sam Sinai, CEO and Co-Founder of Deco Lighting. With integration of DECO Spectrum™ White (3- Channel Tunable White) and DECO Spectrum™ Color (5-Channel Color Tuning), Deco’s Vector Series is taking linear architectural luminaire capabilities to the next level. DECO Spectrum™ brings high-performance circadian rhythm-based illumination to the lighting forefront. As lighting promoting health and well-being has become the gold standard in upcoming lighting technologies, DECO Spectrum™ White is set to take off as the go-to solution for adjustable color temperatures. 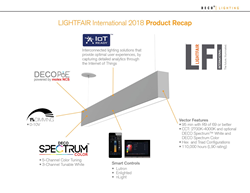 Innovative in the integration of IoT ready lighting solutions into its product line, Deco lighting is projected to surge forward into the market of new, human-centric technologies, leveraging the use of tunable lighting system controls to replicate natural daylight and enhance the visual comfort of occupants. “I feel that our booth at LIGHTFAIR 2018 was an important step in our transition to making specification-grade lighting products. We expanded on our Vector product family offering by highlighting many dimming, color tuning, and control systems available to specifiers. We also presented new luminaire designs that are beautiful, energy efficient, and provide high quality lighting with an emphasis on visual comfort. Moving forward, we are thrilled to provide choices to lighting specifiers that improve the quality of the lit environment while reducing cost and energy consumption,” says Michael Bailey, Director of Engineering and New Product Development at Deco Lighting. In addition to the striking new wireless-ready Vector control capabilities, DECO launched the Coveno LED cove luminaire, a versatile interior fixture featuring a wide range of color temperature choices and adjustable aiming to act as an indirect ambient cove luminaire or direct illumination wall wash fixture.Available with a warm white 2200K up to a neutral white 4000K and also Amber output, the Coveno is built to deliver light that suits the intended interior aesthetic, from intimate and cozy to crisp and vibrant. The wide 120-degree beam angle and adjustable aiming from 0° to 180° provide flexibility when illuminating small cove details, perfect for restaurant and hospitality settings. Delivering next-generation LED efficiency and 90+ CRI for truly accurate interior color rendering, the Coveno reduces electricity costs from traditional fluorescent fixtures all while increasing the overall quality of light. Showcasing two new standard shapes for the Vector linear series, Deco Lighting debuted the Hex andTriad. Vector Hex and Triad luminaires enable a unique set of configurable layouts, such as side-by-side installation for a honeycomb-like structure and a triforce design. Featuring a 2-7/16” wide by 5” tall profile, the Vector Hex and Triad add a sleek, seamless statement to modern interior spaces. The Triad features a bold, robust construction with arms that can be specified in 2-foot, 3-foot, and 4-foot lengths (measured edge-to-edge). While the Vector Hex is equally available in standard sizes of 4-feet, 5-feet, and 7-feet (measured edge-to-edge), blending application versatility with precision engineering for an enhanced ambiance. Both carrying unmatched performance in the architectural space, with a wide range of lumen packages paired with next-level color rendering at 95 CRI minimum and an R9 Value of 69 or better. Delivering up to 1200 lumens per foot of direct output and 1400 lumens per foot of indirect output, the Hex is available in a wide selection of color temperatures ranging from 2700K to 4000K, and optional Deco Spectrum™ White (Tunable White) or Deco Spectrum™ Color (5-Channel Color Tuning). Direct and indirect light output and CCT are independently specifiable and can be operated independently with a Dual Circuit option within the luminaire. Additionally, the Triad is part of the award-winning Vector family, selected by the Illuminating Engineering Society (IES) in its 2017 Progress Report for its best-in-class performance. Both the Hex and Triad feature a projected lifetime of 110,000 hours (L90 rating), enabling these architecturally-focused fixtures to also deliver incredible cost savings and fixture longevity. Focused on researching and developing LED luminaires that combine robust and sleek modern designs with human-centric light output and control options, DECO’s refreshed approach comes at the perfect time in the lighting industry. Offering value-added products and an approach to lighting which marries high-performance technology with a contemporary design sensibility, DECO plans to roll out an assortment of fixtures to further support the company’s specification-grade direction. Several of these cutting-edge interior products were featured at LIGHTFAIR, including the Solo, Evian 2, and Ohm. Scheduled to launch these highly-anticipated products in the coming months, Deco Lighting seeks to further establish its position as a beacon for innovation and technological adaptation, while continuing its position as a leader in solid-state lighting.